Showing results for tags 'China.'. Luigi says... Treat this as a rumor until verified by multiple sources. See item #16. Not varified. Your opine. 18 Oct 2017 Other outside sources... 1. On Sat. Oct. 14 the newly-installed Central Bank of Iraq (CBI) Governor talked about the Dinar being an international currency again, saying there was no longer any restrictions for the Dinar or for any other currency exchanges. 2. Late tonight Oct. 17 Abadi would make an announcement around 7 am Bagdad time (midnight tonight Oct. 17 EDT). 3. Shortly thereafter our 800 number could come out. 4. Bruce would put out the 800 on his website ***removed link*** and email it to those who have registered for it. 5. An information blackout started today Oct. 17 in Iraq. 6. 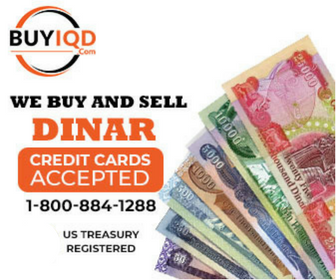 For the last six days there has been a solid rate on the Iraq citizen Dinar Qi cards. Today Oct. 17 a new rate popped up that was almost $4 higher than the old solid rate. 7. The privately negotiated rate (PRN) for us would be even higher than their new rate. 8. There was also a new higher rate on the Dong today Oct. 17. 9. The PNR rates are not screen rates. They are rates for us to negotiate for our humanitarian projects. 10. There were 31 banking institutions that would be exchanging the Dinar, Dong, Ruphia, etc, but not the Zim. HSBC would be the only bank exchanging Zim. 11. Those 31 banks would be sending out emails to their customers who bought currency from them asking them to exchange with them (at the screen rates). 12. The John Q. Public would be getting the banks screen rates. 13. If you want to call the 800 number and obtain an appointment at the exchange centers (at the PNR rates) your appointment would be set up according to your zip code. A special Zim Call Center would handle you if you have Zim. 14. The Primary Call Centers have already been activated. Last night Oct. 16 the seconday Call Centers received an update. Today Oct. 17 around 10:30 pm EDT there would be a final update to the Secondary Call Centers. 15. In Iraq they would have access to their Qi cards our tonight Oct. 17, their morning Oct. 18. 16. Around 9 pm EDT tonight Oct. 17 the Chinese Premier would supposedly make an announcement that the world was on a gold backed system. That announcement would essentially be the announcement of the Global Currency Reset. Luigi says... Take this article as a rumor. There is no direct evidence China is in charge of the IQD RV. China will not push the RV button for Iraq. IMO. China is a contributor. Iraq has the final say so. IMO. 29 Oct 2015 Intel Newshound Bruce... PinkRoses: Bruce call: what is interesting is there was an offering of Chinese bonds in London. PinkRoses: Bruce call: One bond 1 year, one 2 years duration. This is one thing china needed to do to put bonds out there to put themselves in special drawing right (SDR) basket. That was a step China needed to do, and they done it. PinkRoses: Bruce call: you are going to see more and more things happening with the Chinese Reminbi, coming into a world reserve. Timing we are looking for, we think it is right there. We are not looking at anything that will take us past this weekend. Fitzgerald: BRUCE SAYS FROM HRS TO DAYS AWAY PinkRoses: Bruce: hearing hours and days away. That is very good. rates moving up, rates on screens throughout the world. PinkRoses: Bruce call: been exchanges the last 3 days or so. Believe we going to have a shot gun start as far as notification which i do not think it be far off. Are we having celebration call? we still in pre celebration mode still. Alot of money been moving around. PinkRoses: Bruce: major funding now in place with at least one major bank to take care of prosperity programs and our exchanges, money is in place. WE are looking for certain signals, the process is under way, definitely under way. Certain entities have signed off. Firzgerald: Dont make plans to go anywhere for a couple days. PinkRoses: Bruce call: I think it will proceed nicely. NO one make plans to go anywhere they have to go because i think they will be busy next couple of days. Rates are high, and moving higher. The rates are good. Fitzgerald: Q&A NOW Mangelo: Bruce call: Caller- are we waiting for IMF to give the go ahead PinkRoses: Bruce call: Bruce: IMF, i believe they are going to make an announcement, most likely be CL. With the help of China pushing it through. Mangelo: Bruce call: with China pushing it through. PinkRoses: Bruce call: caller: I recieved an email about the new currency, and it indicated that the IMF was waiting for the new currency to be distibuted to state that didnt have them. true? Mangelo: Bruce call: caller is asking if the new currency is at the banks at exchange centers PinkRoses: Bruce: let me say, the new currency we expecting to see is already at the exchange locations, all ready at the banks, and will be inserted in the atm machines when the time it will occur. PinkRoses: Bruce call: the lower denoms, the 1, 5, 10, 20, 50, 100 Iraq denoms, suppose to go out late late late tomorrow night. for that to occur they need an international Iraq. Mangelo: Bruce call: they would need the new international rate PinkRoses: Bruce call: caller: the Goat says the dong not in basket, you have evidence? Bruce: yes I do. Mangelo: Bruce call: caller yes the dong is in the basket and it's way over $2.00. PinkRoses: Bruce call: caller: cap on the ZIM? PinkRoses: Bruce: I am not a cap guy. What I heard so far indicates a cap on the ZIM. Dont go to a tier two bank with lots of ZIM. Go to the 4 major banks as WF. PinkRoses: Bruce call: caller: clarify how exactly on the banks able to exchange my currency into american dollars. PinkRoses: Bruce call: Bruce: the banks collect the currency that is exchange, take the currency give it to the US treasury or give it to an international trading location to give it back to orgin country. Mangelo: Bruce: It is just a little physical move on the money itself, also a digital move. You draw against that exchange in your account. PinkRoses: Bruce call: caller: That means the banks have an agreement with the federal reserve? Bruce: dont worry about it. it is a simple process, the banks already have worked it out. it is all set up. PinkRoses: Bruce: your job is to just show up at the bank, have your act together. PinkRoses: Bruce call: caller: any truth of rumor of ZIM notes, that trillion notes become million notes? PinkRoses: Bruce: yes, trillion notes become million with 6 zeros off, billion notes 3 zeros off. PinkRoses: Bruce call: caller: the US said they may put sanctions on Zimbabwe, if that is the case will it affect the ZIM going in to basket? Bruce: why you bringing that in for? caller: i want clarity Bruce: I havent seen the article. As far as I know we are good to go on the exchange of the ZIM, nothing going to stop that as far as we can see at this point. PinkRoses: Bruce: woudl I hold onto my ZIM? No, i would move quickly on it. exchange it whatever the rate is on the screen… what I heard is fantastic. Mangelo: Bruce call: nothing going to stop it, go ahead the zim right away. it's going to be very good WiseLaura: Bruce thinks that this weekend but when the new denominations are released tomorrow in Iraq we should follow closel He thinks likely for tomorrow night - no guarantee but an excellent opportunity. The dong is well over $2 PinkRoses: Bruce call: caller: Are they taking all the denoms of the ZIM and is the rate higher than .25? PinkRoses: Bruce: not higher than .25, bit lower. We dont know what they going to do with the million and hundred thousand ZIM notes. just take them in and see what happens. PinkRoses: Bruce call: caller: Clarify this, I look at currency exchange earlier today, I saw for the ZIM what it amount to a penny. What I noticed was only available for ten minutes. few hours samething. I called Chase, they not exchange ZIM. If it had remained at that penny, I consider that an exchangeable currency. PinkRoses: Bruce: You are talking about XE.com, an amateur site, not for the pros. I dont care what even the forex say, what is important what the bank screen say. Is it active, you can actively do? The rates will be alive, and exchange allowed then. I wouldnt mess with other than a tier one bank to exchange the ZIM. PinkRoses: Bruce: It doesnt mean anything. When the banks have actual rate on screen, we have appt to exchange, that is what matters and it is real. Look at it as if it was a test, testing the system. Mangelo: Bruce call: caller.. what matters is when it's on the bank screen! PinkRoses: Bruce call: caller: clarify something. you said… large sums of money moved around. Bruce: yes extremely large amounts have moved around. PinkRoses: Bruce: caller: This exchange will be on our acct digitally. What is the purpose of this large amount moving around? PinkRoses: Bruce call: caller: I heard activity on forex. PinkRoses: Bruce: We heard the forex went down other day then came back up. We cant set watch by forex. Dont worry about the forex. Just worry about the bank screens, that is what going to make or break our exchanges. from another source... RV awaits on USA FATCA Tax & Chinese New Year. 2-25-15 R.V. / GCR: Possible exchange next Tuesday, but according to Chinese before the end of the new years (Chinese New Year Celebration Ends Mar. 5th). The devil cheats …so figure any time from now until the day or even a few days after the Chinese new years...Seems they are working on this now,… in order to be in compliance… the United States of America will allow Iraq to untag from the US dollar if they sign the form treaties asked for FATCA taxes. When they do this the global currency reset will take place with all countries and you will bank…. Timber.